So, Spring is in the air and I am so excited! We’re starting to see little flowers blooming all over the park and daffodils, a flower that honestly I never paid much attention to before, seem to be everywhere. Now, I think they are so pretty and will definitely be buying a lot this season. 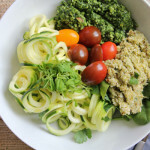 So, in honor of spring, today, it’s all GREEN foods my friends. And we’re celebrating vegetables. I am currently obsessed with brussels sprouts. Roasted Brussels Sprouts to be exact. Even with just olive oil, salt and pepper, these babies are delicious. . but now that I have started experimenting with different recipes and adding different ingredients, I love pairing the brussels sprouts with other things and adding texture, different flavors and crunchiness. This dish was inspired by my love affair with brussels sprouts and by a recent episode of Unique Eats. They featured a restaurant called, M.B. Post in Manhattan Beach, CA, where chef and co–owner David LeFevre is “bringing a playful, artisan menu of small shared plates, hand–crafted cocktails, and small production wines to the South Bay.” They featured David’s Brown Butter Brussels Sprouts with Saba and Emmenthal. They seriously had me at brown butter. Brown butter + my beloved brussels sprouts? Are you kidding me?! I wish I had thought of this but this was all David. And this dish is phenomenal. I, of course, tweaked some things and added some things. . namely pancetta and crispy shallots. And for the vegetarians, all you have to do is omit the pancetta. I took a quick poll on Facebook and everyone said yes to adding pancetta so that’s how we had it. Truthfully, this dish would be just as delicious without it. So, totally up to you. Again, I love all of these flavors together and the added crispy shallots and hazelnuts just bring everything together for me. And my meat-eating husband who doesn’t like brussels sprouts (sacrilege!) actually liked this and ate everything. I hope you enjoy! 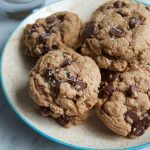 If you have never browned butter before, this link is great. And if you have never toasted hazelnuts before and don’t know how to remove the skins, click here, look at the recipe card, under instructions. Heat a thick-bottomed skillet over medium heat. Add the sliced butter (so it melts more evenly) whisking frequently. Continue to cook the butter. Once melted the butter will foam up a bit, then subside. Watch the butter carefully as lightly browned specks begin to form at the bottom of the pan. Smell the butter; it should have a nutty aroma. Remove from heat and place on a cool surface to help stop the butter from cooking further. 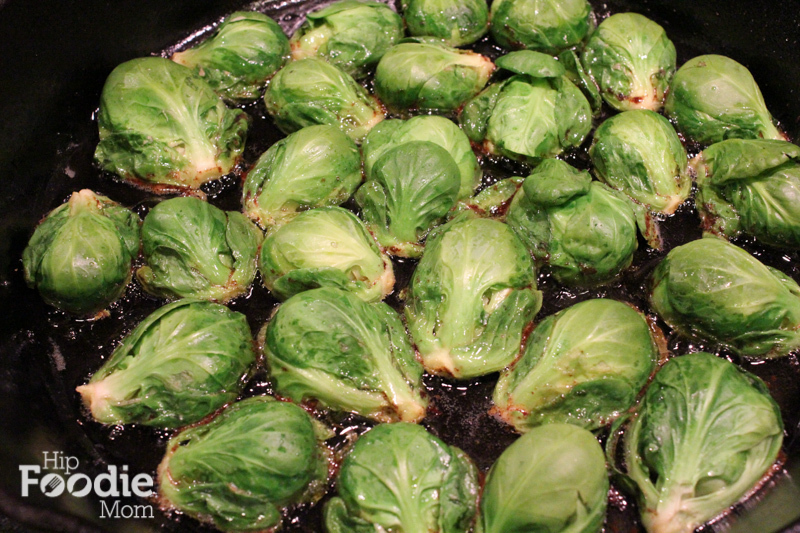 Using a cast iron skillet or non-stick skillet, pour in your browned butter and add the Brussels sprouts, cut side down. Cook until they are dark brown and well caramelized on the cut surface. Season them with salt and pepper and then transfer to a baking dish or prepared cookie sheet and place in the oven to roast for about 7-8 minutes, depending on the size of your brussels sprouts. You just want to ensure they are cooked all the way through but not overcooked. While the Brussels sprouts are roasting in the oven, pan fry your pancetta over medium-high heat until the desired crispiness has been reached. Remove from pan and set aside. 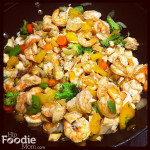 In a small skillet, heat about 1/4 inch of the oil until shimmering. Add the sliced shallots and fry over moderately high heat, stirring occasionally, until golden brown and crisp, or for about 3 minutes. Using a slotted spoon, transfer the fried shallots to paper towels to drain. Once the Brussels sprouts are ready, remove from the oven. To plate: plate your Brussels sprouts, next, add the pancetta if using, then sprinkle the hazelnuts, grated cheese and a few fresh leaves of thyme over the Brussels sprouts. Lastly, top with a mound of the crispy shallots and very lightly drizzle (you don't need much) the aged balsamic vinegar on just before serving. Our first day of Spring, March 20th, is right around the corner! 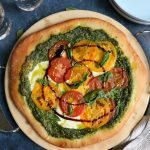 Let’s warm up around the table with our friends from our #SundaySupper team and share delicious spring time recipes! Whether it’s St. Patrick’s Day green, green food or spring inspired, there’s something here to please your taste buds! All you have to do is follow the #SundaySupper hashtag, or you can follow us through TweetChat! 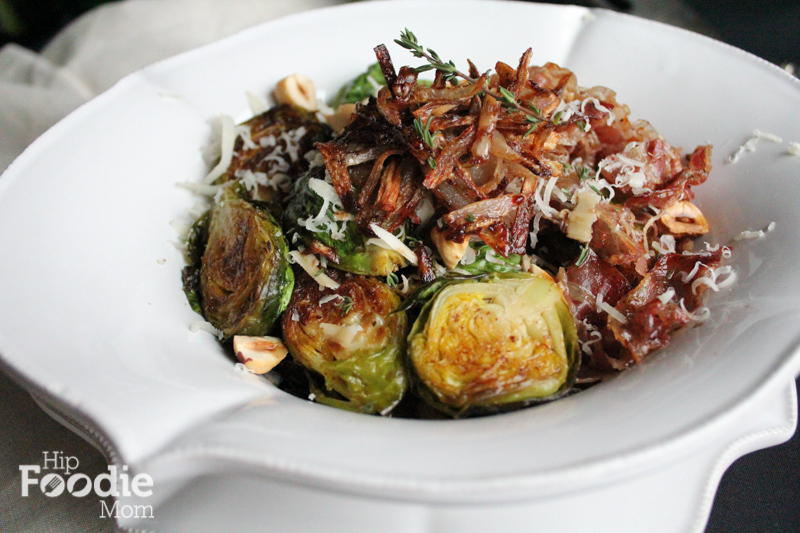 You had me with Brown Butter-Brussel Sprouts- but to add pancetta…looks like a dream recipe to me! I share your feeling about roasting and brown butter. Life in the kitchen changes completely once you discover them. This is a stunning plate of brussels sprouts! 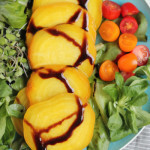 All the ingredients are delicious and can´t wait to try this one Alice! Anyone who thinks they don’t like brussel sprouts should try your dish. I’ve made something very similar and it’s converted more than one hater. OMG. I am SO obsessed with brussel sprouts! I cannot wait to try this! Yes to brussel sprouts 🙂 This house is also a wee bit obsessed with those delectable beauties and it seems that I can never make enough. 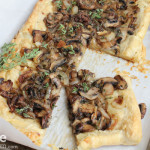 Oh so delicious and the addition of pancetta along with crispy shallots sounds divine!!! Oh, Alice, if this doesn’t turn the hubby into a Brussels sprouts lover, I don’t know what will! Such a fantastic recipe! I love love love brussel sprouts! These look super tasty with the pancetta. Yumm-o! Oh. My. Goodness. I literally gasped at the first photo. I MUST make this!! Crispy pancetta and shallots…I could eat a whole pan of JUST those! 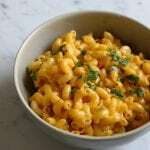 I have been so excited about this recipe ever since you talked about it on Facebook. 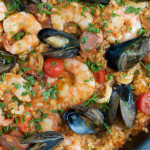 I am making this dish this week no matter what! I can’t wait to eat it. You and I are in sync right now. I’ve got some Brussels sprouts cooking it in the fridge, and I have plans to roast them tonight. My appetite was piqued when I saw a feature on Brussels sprouts recently on the Cooking Channel’s “The Best Food I Ever Ate.” I forget the restaurant, but they used ghee to brown the sprouts before roasting. Great looking dish, here! This looks like the perfect way to enjoy brussels sprouts. I had some delicious ones at a restaurant in Denver that were pretty similar to this. I am totally going to make this, Alice. I love Brussels sprouts, and I’m always looking for great recipes for them. Pinning this one right now! There is so much goodness going on here. I love roasting brussels sprouts, but I never thought to add cheese. And of course, your photos are totally gorge! OMG, you have to go! 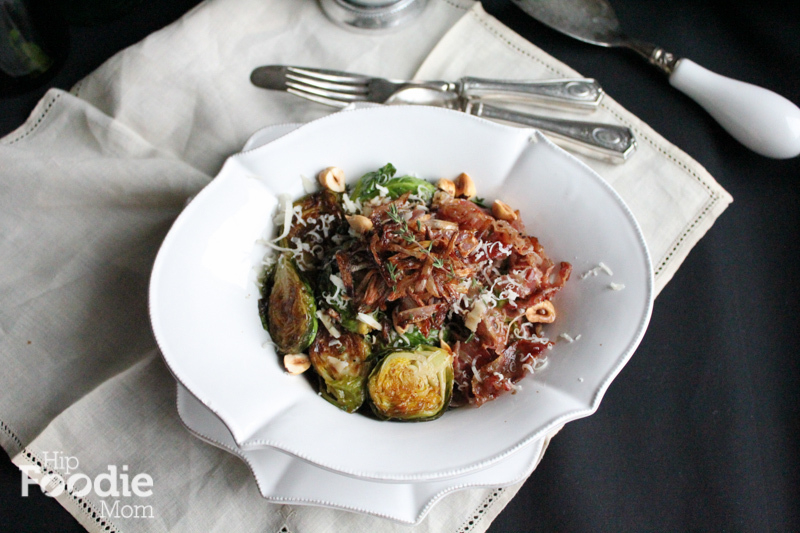 I adore brussel sprouts – these ones look perfectly caramelized and I love the crispy shallots on top – delicious! Thank you, Amy! Yes, I love shallots and the crispy shallots added more flavor and texture for me! Wow, this looks and sounds incredible! 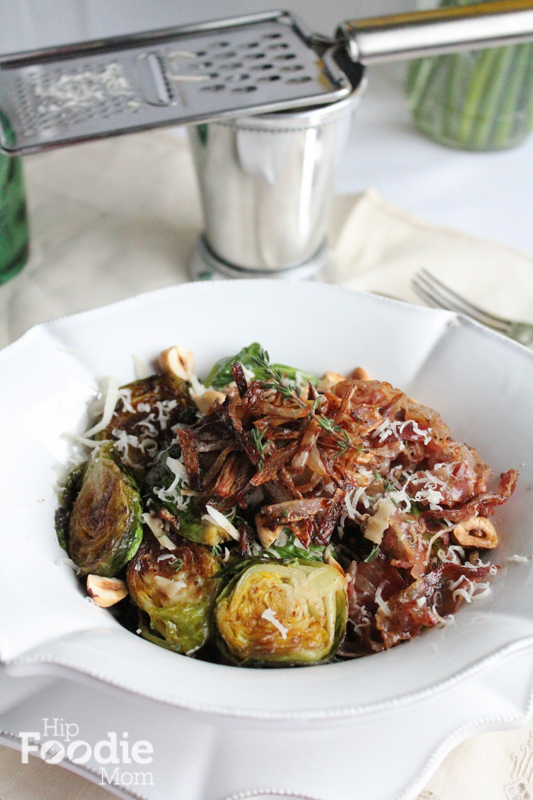 I also love roasted brussels, and with all these yummy additions, it sounds heavenly! 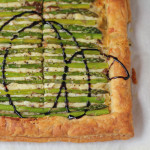 I also love that you added gruyere to it- what a lovely idea… mmmm! 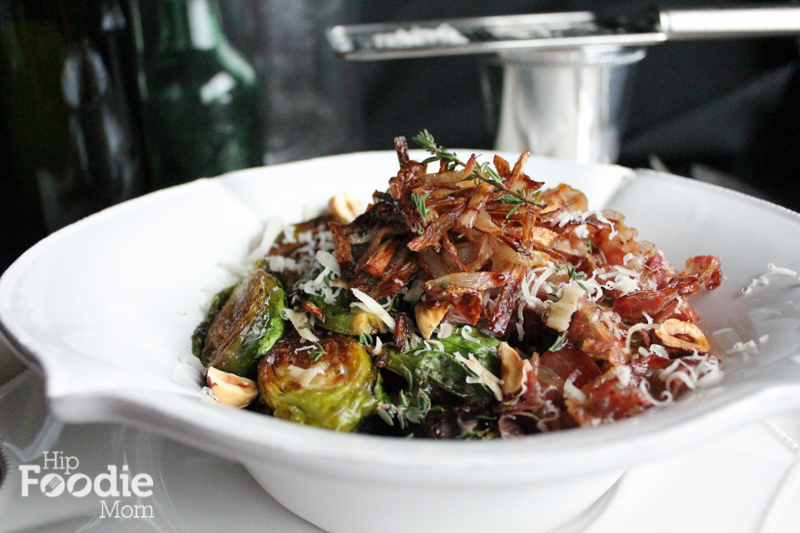 Pancetta and brussels sprouts, can you get any better than this?! 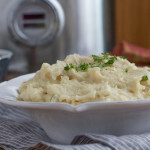 Browned butter makes peasant food so much more upscale, not to mention delicious! Oh wow! My mouth is watering. I love brussels sprouts so much and your recipe sounds fantastic. Do you think it would work okay with frozen and defrosted brussels sprouts? Thanks! Hi Nancy, I would think so (but I have never tried with frozen), just make sure you pat down the brussels sprouts with paper towels so they are completely dry before you cook them. 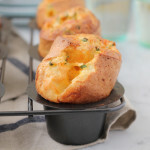 If you try this, please let me know how they turn out! In a word – Amazing! I’ve just recently fallen in love with roasted brussel sprouts after avoiding for many year. Pinning this recipe! Looks fantastic! Great way to have Brussels Sprouts!! You can make anything amazing and delicious, Alice! I’ve only had brussel sprouts once in my life, when I was a teenager. They were horrible – steamed, mushy, and pungent. Blech. I’m sure that your version is a thousand times better. 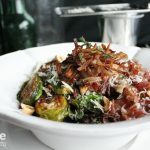 The beautiful char on the brussel sprouts and the crispy pancetta and shallots are calling my name. Alice this sounds sooooo good! What a wonderful site! I am the only one in my home that likes (adores) brussel sprouts. I am hoping with this recipe, I can convert at least one person. Interestingly, I was reading a few months ago that there is a “gene” that determines if you like them or not! I’ve got the gene because I love them. 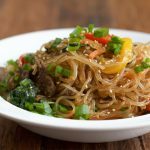 Love brussel sprout recipes also – but this is a better idea – love the combination of ingredients!